THE MOST PRO-ACTIVE BODEGA IN D.O. TORO? There are many French wine producers who, if you catch them during a veracious moment, will tell you that it does not pay to keep your head in the sand in the competitive world of winemaking/marketing! Considerable market share was lost by chateaux that did just that as their inert, wholly inappropriate response to the influx of New World wines into Europe in the 80’s and 90’s. Some never recovered. In Spain it was a different story. Bodegas were happy to listen to new ideas, invest in modern technology and to blend these with their own winemaking tradition. It’s proven to be a winning mix. However as many bodegas did this there was a danger that the status quo, albeit now on a higher level, would remain the same. The trick was to become pro-active rather than re-active if bodegas wanted to move ahead of their national competitors. Nicola seals the deal with an important export client! In my time in wine (some twenty years now) I’ve not come across a more pro-active person than Nicola, of Bodegas Fariña. Formerly of Bodegas Bajoz (where she and the similarly young team completely turned around the fortunes of this cooperative bodega until, inexplicably, the owners did an about turn), Nicola went to Bodegas Fariña where she was given her head, and where she continues to enjoy such support. I received from Nicola several wines to taste in this new year and then was delighted to meet her again in Alimentaria, Barcelona. Over several wine tastes (incidentally, with her main distributor from India – demonstrating the strength of the export arm of Bodegas Fariña), we discussed the nature of the business, the wines we were tasting and of course the bodega’s plans for the future. She and Bodegas Fariña remain as forward thinking as ever and their increasing sales, both in the domestic market as well as in exports reveal how it is this attitude that will ensure progress during such troubled financial times. As long as the wines are good! Well have no fear, if you like your red wines to be darkly coloured, full of fruit character with wholly integrated oak and mineral notes too, this is where you should look. The first wine tasted, at home in my office (equipped with various tasting glasses, decanters, vacuvins and assorted wine tasting paraphernalia) was the fresh and fruity Primero 2009, which boasts being made from grapes that were on the vines in September and in the bottle just two months later – Toro Nouveaux! Beaujolais it’s not, however, and I mean that as a compliment. The French equivalent is made from the far lighter coloured and more delicately flavoured Gamay variety. Primero is made from Tinta de Toro (aka Tempranillo) – which, as the name implies (the blood of bulls! ), is a deeper, darker and richer drop all together! And yet the carbonic maceration method by which it is made ensures that it is as fruity as you like – great start! Next we went for the Colegiata Tinto 2009 – same year, same varieties but not Carbonic Maceration. A different style of wine, fruity for sure, with violets on the nose but a little deeper, even without wood. The Gran Colegiata Tinto Roble 2008, as its name suggests, has had some oak ageing (4 months) but that’s not all – it’s made only from the free run juice, the best juice, obtained before major pressing. Taste this and compare it with most cheap supermarket wines, whose grapes have been crushed, not pressed, mercilessly! Gran Colegiata Crianza 2006 Roble Frances, has of course been aged in French Oak, in fact for 11 months. The trademark dark colour is enhanced by the concentrated nature of the wine. It’s spicy with elements of burnt wood on the nose and yet in the mouth it’s all fruit, dark and brambly. The Reserva 2001 also has 100% Tinta de Toro grapes but more time in wood, American, and in bottle too. It’s super winemaking as the often exuberant American oak (in-your-face, to put it in American parlance!) is tamed to be an integral, complementing element rather than ruling the roost. The Gran Colegiata Campus is their flagship wine. There’s a nice link between the ancient Roman name for Toro, Campus, and the fact that Spain’s oldest University, now situated in Salamanca actually originated in Toro, campus and all! The grapes are hand-harvested from 50 – 140(!) year old Tinta de Toro vines and then the selection table is used to sort only the best grapes for the final choice. Taste the wine and you’ll see that all this care is well worth it! A Costa News Top Ten wine, and deserving of the plaudit! So these are the Fariña wines tasted at home but what of those tasted in Barcelona? Well pro-active is the by-word – Spanish Sons is a brand made in co-operation with an American distributor. The play on the word ‘Sons’ is obvious in one sense, we all talk about the sunshine in Spain, but this is spelt the other way, meaning children, and the artistic label has silhouettes of the three generations that are behind the Fariña business. Made from 50% Tempranillo from the VdlT vineyards they operate and 50% Tinta de Toro from Toro. Ricardo Sanchez is another joint venture from their VdlT vineyards, but this time with a German distributor. Vineyards of 50 – 70 years of age produce the grapes, some of which are from Pie Franco vines, descendants of the philoxera-resistant vines of another age. If you have a look in Carrefour you’ll find Fariña wines and also in Mercadonna you’ll see the environment-friendly wines which use less glass and make less of a carbon footprint. All of the above is in the pro-active camp, as I said, but don’t expect Nicola or Bodegas Fariña to let the grass grow under feet. This bodega is at the forefront of innovation in DO Toro, all the time seeking to please the client, both with the quality of the wine and in the way they are made. It must have been a difficult decision but, perhaps because of three generations worth of roots, Bodegas Castaño opted to take a stand with the DO Yecla at the recent Alimentaria wine fair in Barcelona. In fact they could have done the same with DO Alicante and indeed, nowadays with DO Jumilla. 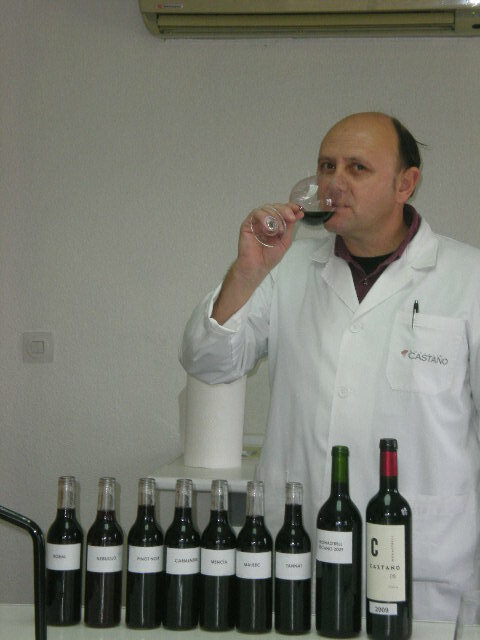 Bodegas Castaño has become a triumvirate! Bodegas Castaño (aka Bodegas Sierra Salinas and the most recent addition, Bodegas Altos del Cuadrado) is very much a rise, and rise story. During filming for Viva Vino, the Viva TV series last August, Daniel Castaño and I stood in the original Yecla vineyards (80+ years old, that’s the vineyards, not Daniel!) where his grandfather had planted the gnarled old Monastrell vines that surrounded us, which then were in the flush of youth. His faith in this indigenous variety has been born out as the wines that these vines produce is nothing short of excellent. In DO Alicante the following September Daniel’s father and I stood, again in an old vineyard, but this time in the valley of the mountain range, Sierra Salinas, where Señor Castaño taught me some of the skills of vine pruning – again for the TV series. The Bodegas Sierra Salinas portfolio of wines is expanding, their four award winning red wines (90+ Parker and Peñin Guide points) have been joined by a rosado (lovely raspberry fruit) and a fruit driven, aromatic fresh and clean white. I’ve yet to visit the vineyards of Altos del Cuadrado in DO Jumilla, but if the wines I have recently tasted are anything to go by, I can’t wait to meet up again with this wine-passionate family! It will be different soils, a different micro-climate, some different grape varieties (but never losing faith with the noble Monastrell) – however the one constant will be their determination to produce wines of top quality but with consumer-friendly prices. The charming Raquel sent me two of their new wines. Jumilla also is a Monastrell area (given the Castaño’s love of, and belief in, this grape variety it would be hard to imagine them further developing their empire in an area where Monastrell was not one of the approved varieties!) so as you might imagine both wines have Monastrell in the blend. The first has perhaps the most minimalist front label I’ve seen in Spain, simply called Monastrell 2008 it also sports the Altos del Cuadrado logo and that’s all you get! However on the back label, whilst not expansive, there is a little more information and we find that in fact there is also 10% Petit Verdot and just 5% Cabernet Sauvignon. It’s a semi-crianza wine resting in barrel (American and French) for just 4 months – sufficient time to add a touch of vanilla flavour but also some depth. I’m interested in the blend. 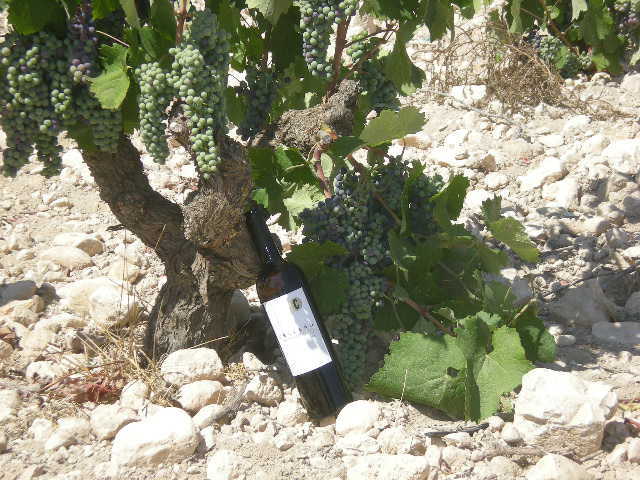 I love Monastrell, be it a partner in a wine or the sole variety used. I’m less partial to those wines that are made entirely of Petit Verdot. However, when judiciously used in a blend (and that for me is well less than 50% of the mix) they add a certain silkiness to the moutfeel and a richness to the flavour. Therefore as expected this one fits the bill nicely, with the addition of a tiny, but nevertheless significant, amount of Cabernet which adds colour, complexity and an almost imperceptible touch of blackcurrant. Triple V 2006 is a step up the quality ladder. Made from Monastrell (claro!) and 15% Petit Verdot the vines that furnished the grapes for this wine are old. If you want an example of the difference between old vine wines and more youthful ones you couldn’t do much better than tasting this wine. As many readers know, older vines mean fewer grapes and therefore a more limited production – however those grapes a far richer than the young upstarts and the consequent mouthfeel and depth of flavor is easily noticeable. It’s the case with Triple V. It’s a well rounded juicy, chewy wine whose damson and blackberry confiture flavours linger after swallowing. There’s a touch of burnt wood about it too as if the barrel toasting lasted a little longer than the usual medium time, or maybe the ancient wood of the scorched vines has some how been transmitted into the wine! But you have to look for it as it rests in your mouth vaporising and sending flavour messages to the brain via the olfactory passage. It’s a lovely wine, like its stable-mate above – and makes me ant to look out for more from this third arm of the Castaño dynasty. 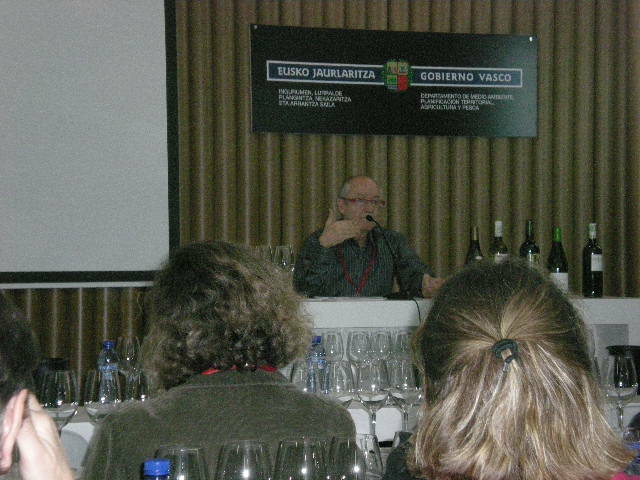 Grupo Castaño's Head Winemaker, Marciano, talks us through the new vintage wines. last December? We tasted the 2009 vintage of their lovely Chardonnay Macabeo white wine before it went on the market in the New Year, having drunk a bottle of the 2008 at home the same week. We all felt that the oak ageing and the two different varieties were not quite in harmony at that time. Well they certainly are now! This creamy green apple wine is a delight and I’m be looking for more! 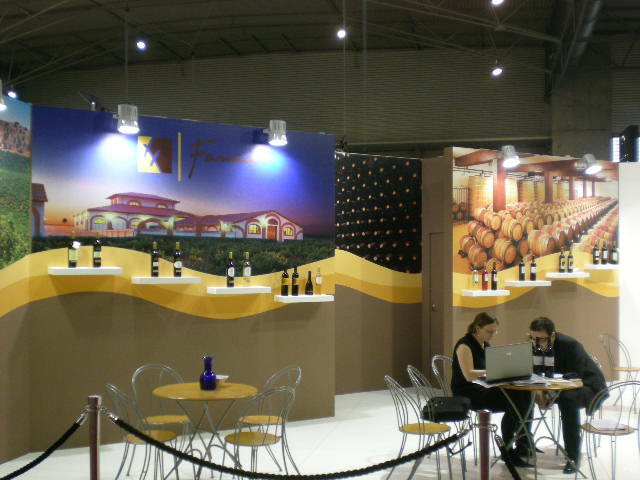 Of all the many tastings I went to at Alimentaria, Barcelona, in March, the one that was most popular (beyond the point of saturation, in fact, as several would-be tasters had to miss out as all the seats were taken) was that organised by the Grandes Pagos de España Group. A special, professionally equipped, large tasting room had been reserved to accommodate the capacity gate expected and it was quickly filled with journalists, buyers and other cognoscenti – all of us anxious to learn more about this group and to taste their offerings. 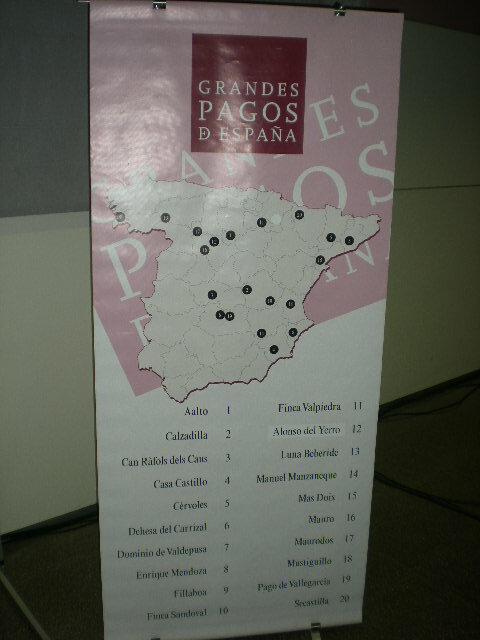 Grandes Pagos de España was started by a small group of dedicated winemakers and bodega owners committed to maintaining and even raising the standard of top winemaking in Spain. Their ideal was to protect, proclaim and publicise the best single-estate vineyards, where, they would argue, the best Spanish wines come from. After this tasting I’m not about to argue with them – all the wins were superior quality, some breathtakingly wonderful! Originally formed around single-estate vineyards in the Old and New Castille areas, the organisation now covers other wine producing zones in Spain where single-estate wines are made by winemakers who share the common goal. My only criticism of the tasting was that it was far too speedy, without giving tasters sufficient time to reflect and make more in-depth analyses of the super wines on show. The reason for this was the volume of wines to be tasted, 21 in total, and the limited time in which to do so. Nevertheless there was time enough to learn about some of the bodegas involved (though not enough time to take notes!) and to taste at least some of the wonderful flavours, sniff the floral, herb and fruit aromas that abounded and indeed feel the terroir from whence they came! They came in flights of wines from similar areas – there were only three whites on show though, a shame as there are more I believe, but reds do outnumber the whites, considerably it seems. Given the velocity of the presentation, never mind the flights, my notes are proportionally economical, however the overriding view that remains with me still is that the wines really were a step up in quality. Furthermore they certainly achieve their goal of being representative of their vineyards. Anyone who may be sceptical about the concept of ‘terroir’, i.e. a wine being the sum of its specific soils and microclimate, first and foremost, will have had his opinion turned around for sure. These wines speak of the earth and we must make sure we preserve them! My favourite white, for example was the elegant Selección Finca Montealto from Bodegas Fillaboa, DO Rias Baixas, and yes, you guessed it, made with 100% Albariño. Perhaps personification of perfect Albariño – outstanding! El Rocallís from Bodegas Can Rafols dels Caus was an excellent oddity – a white wine made from an Italian grape variety, Incrocio Manzoni, a Riesling/Pinot Blanc cross, and unique in Spain. It’s really quite yellow in colour with a melange of indeterminate fruit backed by creamy oak. Remarkable! I almost gasped when I tried the first red, 100% Cabernet Sauvignon from the 2004 vintage, it was so up-front fruity, big, dark and juicy with pronounced minerality – was this going to be indicative of the rest? Dehesa del Carrizal has had 18 months in French oak and is a super wine! The next was marginally better – Gran Calzadilla 2005, lovely and juicy and obviously made from Tempranillo and Cabernet at their optimum ripeness – gorgeous dark minty chocolate finish! Finca Terrerazo 2007 also has that minerality and bags of fruit with a great depth too. Mendoza’s Santa Rosa was excellent too. I loved Finca Sandoval, bottled only in magnums and made from Portugal’s Touriga Nacional variety with Syrah too, pleasantly confusing Burgundy notes on the nose and palate. Finca Valpiedra Reserva was a classic example of a wonderfully common element in all these wines, mineral notes to the fore and in this case wholly appropriate considering the ‘piedra’ in the name! Bodegas Viñas del Vero’s (DO Somanto) Secastilla, made mostly from Garnacha has waves of secondary flavours and aromas as it develops in the glass along with lovely twists and turns on the mid-palate. Salanques from Priorat’s Mas Doix bodga is a super wine, big and voluptuous, and yet with elegance and finesse too. Pago Garduña from Bodegas Abadia Retuerta is a splendid wine with forward fruit and a balancing acidity. Aalto PS 2006 from Ribera del Duero was in my top three, made by Vega Sicilia’s winemaker it has everything you need from a top quality wine. Finally my favourite of the tasting, and this remember is from an exceptionally good group, was Mauro VS 2005 from Bodegas Mauro. So many flavour levels going to a glorious depth and complexity and a perfume to marvel at – does Tempranillo get better than this? Some of the 21 wines tasted at the excellent Grandes Pagos de España tasting! Once again the Costa News sent me packing for my biennial trip to Barcelona for the excellent Alimentaria wine and food fair towards the end of March, proving our commitment to keeping our readers informed about the Spanish wine scene. Although smaller than previous years owing to the financial crisis and some dreadful planning on somebody’s part as there was a clash with ProWein, the major German wine fair, Alimentaria was still huge! For a wine anorak/investigative journalist like myself it was really fascinating – the more so when I managed to fit into my itinerary a tutored tasting led by Señor Peñin, of the internationally famous Spanish wine guide, the Peñin Guide, which is often referred to in Cork Talk. The title of Señor Peñin’s talk was The White Wines of Rioja Alavesa – at first the idea quite surprised me. In truth, although it’s not admitted up in the hallowed pastures of La Rioja, white wine is really an after-thought. The autonomous region of La Rioja is red wine country, some of it the finest that Spain can produce. White wine is mostly made for cash flow. Yes there are some whites that deserve recognition and are more enjoyable than just the ordinary, but it’s no surprise to see, in fact in the Peñin Guide, that there are only two white wines mentioned in the top 30 from the region. 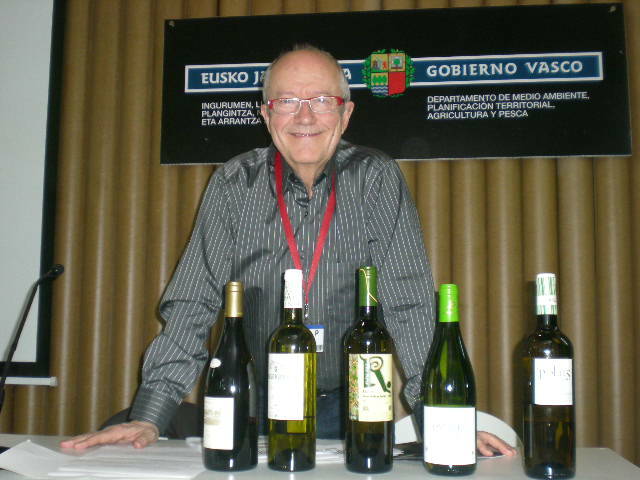 So why a tasting specifically about white wines from one of the three areas of La Rioja? Well, readers of last week’s article will know that in my opinion this was probably a deliberate attempt to fight the corner for traditional white Rioja in the face of attack by some upstarts who insist on making white wine only in the same area, and on using unapproved varieties! However I entered the tasting with a clear and open mind. Señor Peñin can teach me a thing or two, I know. His presentation was erudite and articulate; he was very professional, and he’d done his homework, although I’m sure many of the facts are stored in his wine brain anyway. I listened and learned, anxious to try the wines he had lined up for us. The first was Polus Blanco 2009, Bodegas Loli Casado. Made from 100% Viura, the favoured grape variety of the region, but not by me as in the past I’ve found is lacking in character. The vineyards are 70 years old so if they can’t make a wine with personality then I doubt Viura can. Señor Peñin found a touch of pineapple, of tropical fruit with a citrus element too. Me? Well search as I did, and open-mindedly too, I could stretch a point and say that there may just have been a touch of grapefruit. Sorry Señor, I’m not convinced. Next Ostatu Blanco 2009, Bodega Ostatu, 90% Viura and 10% Malvasia. This had a touch more acidity and citrus on the nose and palate and was slightly paler in colour (in other words like water!). For me the Malvasia helped the wine, giving it a little more flavour that the former, but I couldn’t find any tropical fruit again and not the ‘dry river bed minerality’ referred to by our host. The Erre Punto Blanco 2008, Bodegas Remirez de Ganuza, less Viura, 60% and the rest Malvasia with 6 months in oak. On first hit there was a pleasing Crême Fraîche flavour. The oak has benefited the wine but I don’t go along with the 5 years longevity Señor Peñin suggests and would ask why keep it anyway? I couldn’t find the herbs he was talking about either. Valserrano Blanco FB 2008, from Bodegas y Viñedoa de la Marquesa has only 5% Malvasia but was fermented in oak and left for 6 months. The more golden colour promised better things and on first taste there was a touch of honey, but this was immediately swept away by fresh slightly citrus acidity. Again it didn’t work for me. The final wine was one of which I expected great things – there was no Viura in it! In fact it’s an eclectic blend of actually unauthorised grape varieties – Moscatel, Garnacha Blanca, Viognier, Chardonnay, Roussane, Marsanne and Petit Courbout (about which I, and Señor Peñin, are totallyignorant). Also this brew has had 16 months in oak, for me a little too long. There’s so much fruit and herb flavour in there it’s a shame to mask it with wood. It was the best wine of the bunch, and if it had been representative of the wines of the area, I’d be buying Rioja whites often – but it isn’t, and I don’t! A surprisingly poorly attended Rioja White Wine tasting with Señor Peñin. At the same time the White Wine Geurrillas from the same area were being tasted with a capacity audience!